When I am out in the community, I hear concerns from residents regarding public safety. 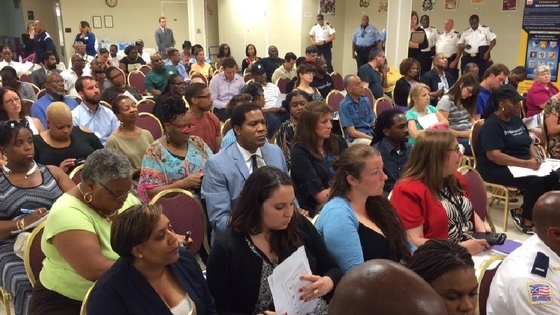 As a result, I held a public safety summit in the Trinidad neighborhood of Ward 5, with nearly 300 residents in attendance, to address the recent spike in crime in the District. Historically, the District has seen an increase in crime during the summer months. However there have been 94 homicides in the District this year, an alarming 31% increase from last year. Although, the overall violent crime rate is down, the spike in crime is troubling. I am working closely with Chief of Police Cathy Lanier, Mayor Muriel Bowser and city officials on new strategies to combat crime. The summit which I facilitated, consisted of 14 panelists to include Deputy Mayor for Public Safety and Justice, Kevin Donahue; Metropolitan Police Department Assistant Chief, Peter Newsham; Acting United States Attorney, Vincent Cohen; Attorney General, Karl Racine and the Department of Youth Rehabilitation Services Director, Clinton Lacey. Among residents' concerns were the usage and prevalence of synthetic drugs, violence as a result of synthetic drug usage and enforcement mechanisms for store owners that are found selling synthetic narcotics. Other issues raised were building trust and better relations between the community and police. Residents also provided recommendations for additional educational activities for our youth with a focus on building community partnerships as a method to deter crime. Both Attorney General Karl Racine and Acting United States Attorney Vincent Cohen spoke directly to the public’s concern regarding synthetic drugs. Cohen stated that the District has six pending prosecutions against stores caught selling the harmful drugs. Racine addressed the myth commonly conveyed by users that synthetic drugs won’t be detected in a drug test. He stated that individuals may not test positive but will find themselves in a violent situation because of the harmful and dangerous effects (hallucination, self-harm, violent behavior, seizures, vomiting, raised blood pressure.) The Attorney General also stated that his office will conduct outreach in the homeless shelters to include Central Union Mission and D.C. General to educate our most vulnerable population on synthetic drugs. The message consistent among residents was the importance of relationship building – among police and community and our youth. Assistant Chief Newsham stated that having police on foot is much more successful in developing relationships within the community. Clinton Lacey posed the question how do we reach our young people? He stated that relationship building for our young people is key, particularly for those youth that are disconnected and in crisis who oftentimes feel overlooked. Education, credible messengers, mentoring programs, community partnerships were constant throughout the discussion. The public safety summit was an opportunity for residents to address their public safety concerns with public officials and experts within the field. We need to come together as a community to address the issue of crime. It starts with us. Chief Lanier cannot solve it on her own. Acting US Attorney Vince Cohen cannot solve it on his own, and residents cannot solve it on their own. It is going to take a collaborative approach between the community, government and the police to stem the tide of violence in our streets, and I am hopeful that these continued dialogues will go a long way to informing both government agencies and residents as to how we can work together. View pictures from the public safety summit here. Councilmember McDuffie supports the use of body-worn cameras as a tool to strengthen police accountability and improve community relations. The Council’s approved budget for Fiscal Year 2016 – as recommended by Councilmember McDuffie’s Judiciary Committee – includes funding for 1,600 body-worn cameras by the Metropolitan Police Department (MPD), provided the Mayor identifies funding to make footage accessible to the public. In the budget, the Council additionally required the Mayor to submit proposed regulations for review by October 1, to outline policies and procedures for disclosing footage while protecting privacy. Currently, the Mayor, the Councilmember’s office, and stakeholders are developing these regulations with the goal of reaching a compromise that balances the need for transparency and protects people's right to privacy. 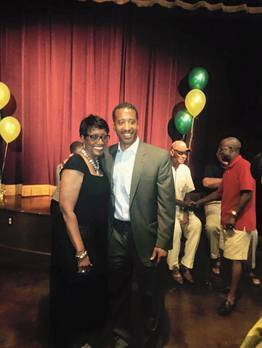 On July 10, Councilmember McDuffie attended a signing ceremony for emergency legislation designed to curb the buying and selling of synthetic drugs by District businesses. The abuse of synthetic drugs has risen significantly in recent months. The “Sale of Synthetic Drugs Emergency Amendment Act of 2015” allows the Chief of Police to close a business for 96 hours and issue a fine of $10,000 for the first offense, and 30 days and $20,000 for a subsequent offense. The Committee will hold a hearing on the permanent version of the legislation shortly after returning from recess in September. 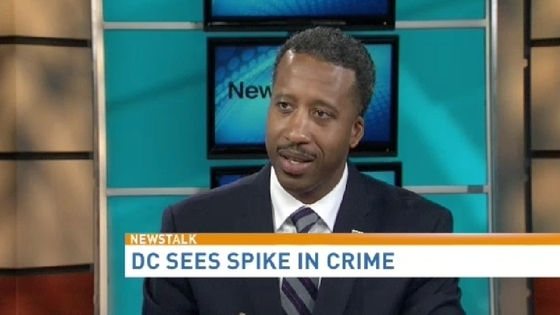 On Tuesday, July 29, Councilmember McDuffie sat down with Bruce DePuyt of News Talk on News Channel 8 for a conversation regarding the recent spike in crime, street cars, and D.C. being back in the running to host the 2024 Olympic games. Click here to see the full video. Ronald Mason, formerly of Southern University, was recently appointed President of the University of the District of Columbia. To welcome President Mason to the District, and to Ward 5, Councilmember McDuffie gave President Mason a tour of our Ward on July 29th. On their tour, President Mason and the Councilmember visited Dunbar High School. President Mason spoke with the new Principal of Dunbar, Abdullah Zaki, about how UDC could better serve D.C. Public School students. The pair also took the opportunity to tour the Dunbar High School museum and walk through the school to learn the rich history of Dunbar and to see the beautiful new facility. After leaving Dunbar, the Councilmember and President Mason also visited Washington Mathematics, Science, and Technology Public Charter High School, giving President Mason a view into our public charter school system. President Mason took the opportunity to discuss potential new partnerships with the school administration. 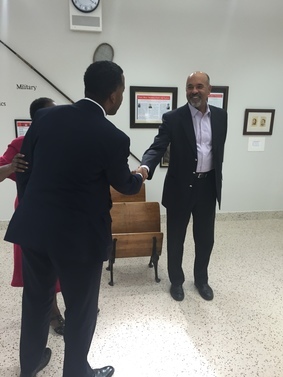 After the tour, Councilmember McDuffie also helped connect President Mason to many of our other Ward 5 high schools and educational institutions, ensuring that UDC continues to be a strong partner for our community. Councilmember McDuffie believes that our students will benefit from a robust relationship between UDC and our public and public charter schools. Click here to view pictures.it this placeholder text. 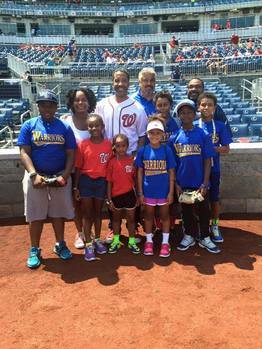 On Saturday, August 9, Councilmember McDuffie received the Washington Nationals Spirit Award on the field during a pregame ceremony alongside Ward 5’s Woodridge Warriors youth organization. Although a very bitter sweet moment for the Councilmember, Jeannette Mobley was celebrated for her invaluable dedication to serving in the role of Chief of Staff and acknowledged for her excellent rapport with the community. Jeanette has retired from D.C. government but will never stop serving as a champion for the residents of Ward 5 and we applaud her for her commitment to public service. See the farewell video here. Councilmember McDuffie is pleased to announce Ronan Gulstone as his new Chief of Staff and Dionne Johnson Calhoun, Deputy Chief of Staff/Communications Director, our newest addition to Team McDuffie. We encourage you to participate in a citywide survey that will help us better understand D.C. resident’s opinions about safety and policing in their neighborhood. Please click on this link to take the survey: https://www.surveymonkey.com/r/DC-Safety-Survey. 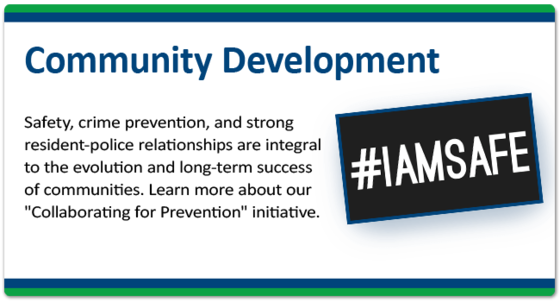 You can also text “iamsafe” to 313131 to have a link to the survey sent to your phone. This survey is a collaborative effort between the Community Preservation and Development Corporation (CPDC) and the Council for Court Excellence (CCE), two nonprofit organizations here in DC. Your answers are confidential. A report of the findings will be produced this fall and will be made available on both the CPDC and CCE websites: www.cpdc.org and www.courtexcellence.org.